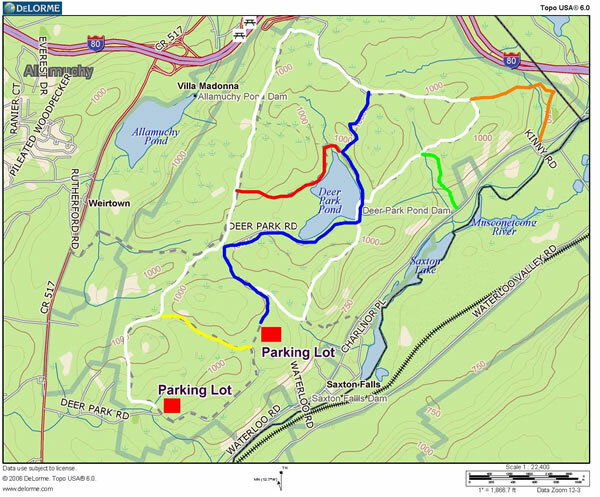 The Deer Park Trail is the main trail within the Southern section of Allamuchy Mountain State Park as it follows the perimeter of the park’s trail network and provides access to all other trails within the southern section of the park. The easiest access point is from the first parking lot. When facing the exit to the park, the entrance to the Deer Path Trail is in the upper right corner of the parking lot and immediately crosses a small dam. Access to the Deer Park Trail is also available at the junction of the Lake View Trail (blue blazes) which is located at the second parking lot. When accessing the Deer Path Trail from the first parking lot (clockwise direction) the trail begins with a moderate sustained climb. The trail then becomes rolling. The Deer Path Trail meets the junction of the Birch Trail (yellow blazes) at approximately 0.8 miles from the first parking lot. The trail then meets the southern junction of the Barberry Trail (red blaze) at approximately 1.7 miles from the first parking lot. The Deer Path Trail will eventually come to a “T” where the trail turns left and proceeds down a short, loose rocky descent eventually meeting the northern junction of the Lake View Trail (blue blaze) at approximately 3.4 miles. The Deer Path Trail then continues with rolling terrain, eventually meeting the junction of the Waterloo North Trail (orange blaze) at approximately 4.0 miles, and then the Waterloo South Trail (green blazes) at approximately 4.5 miles. An interesting feature of this trail is several boardwalk crossings that navigate users through several wet sections. Eventually the Deer Path Trail will once again meet with the Lake View Trail (blue blazes), approximately 5.0 miles, where the user can enjoy a view of Deer Park Pond. The Deer Path Trail then continues across the dam and straight into the woods, beginning a moderate climb. Following the summit, the trail immediately begins to descend a moderate loose, rocky hill, eventually making a hard right turn. The trail ascends again, meeting with a gravel road, which is the junction of the Lake View Trail (blue blazes). The Birch Trail can be accessed from either the Deer Park Trail, approximately 0.8 miles from the first parking lot or on the gravel road just south (towards the park exit) of the second parking. This trail is a gently rolling trail with no significant gain or loss of elevation and is relatively smooth. The Barberry Trail can be accessed from either the Deer Park Trail, approximately 1.7 miles from the first parking lot, or from the Lake View Trail, at the Northern end of the lake. This trail is a rolling trail with some rocky areas and elevation changes with a section of trail that travels along the northwest side of Deer Park Pond. The Lake View Trail is most easily accessed from the second parking lot. The trail follows a gravel road, eventually coming to the dam at Deer Path Pond, located approximately 1.5 miles from the second parking lot. Following the dam, the Lake View Trail narrows as it passes through a grove of aromatic pine trees. Approximately 1.6 miles from the second parking lot the Lake View Trail meets the junction of the Barberry Trail (red blazes), eventually meeting the Deer Park Trail (white blazes), which is where this trail, The Lake View Trail (blue blazes) ends. The Waterloo North trail is most easily accessed from Waterloo Road. However the Waterloo North Trail can be accessed from the Deer Park Trail (white blaze) as well. When accessing this trail from the Waterloo Road trailhead the trail begins with a moderate sustained climb. Eventually leveling out temporarily as it crosses a small creek. The trail then begins another moderate ascent with short sections of loose rock and some roots. This trail ends at the junction of the Deer Park Trail (white blazes). The Waterloo South Trail is most easily accessed from Waterloo Road. However the Waterloo South Trail can be accessed from the Deer Park Trail (white blaze) as well. When accessing this trail from the Waterloo Road trailhead the trail immediately begins with a moderate sustained climb until it meets the junction of the Deer Park Trail at approximately 0.5 miles from Waterloo Road.